From late October 1999 UNTAET (United Nations Transitional Administration) was responsible for the security of the East Timorese people. Humanitarian aid and reconstruction and recovery were the main focus in this ravaged territory. In July 2000 a new governing structure was established which designed policies and undertook plans for the transition to full independence. This new governing structure was called the East Timor Transitional Administration (ETTA). The ETTA cabined had nine ministries. UNTAET officials headed the ministries of Internal Security, Justice, Political, Constituent and Electoral Affairs and Finance. The East Timorese were responsible for the ministries of Internal Administration, Infrastructure, Economic Affairs, Foreign Affairs, and Social Affairs (U.S. Department of State East Timor: Country Reports on Human rights Practices—2001; http://www.state.gov/g/drl/rls/hrrpt/2001/eap/8300.htm). In October 2000 UNTAET appointed a 36-member National Council (NC). NC was comprised of East Timorese representatives of the 13 districts, the CNRT, other political groups and variety of NGOs, youth and religious groups (ibid). CNRT continued to benefit from a close relationship with UNTAET. However by late 2000 disagreement within CNRT surfaced and the historical factionalism re-emerged. The leaders of the FRETILIN and UDT parties broke away from CNRT and refused participation in the National Congress. In December 2000 a proposed timeline for the process leading to the election of a constituent assembly, the drafting of a constitution and independence was presented to the National Congress by CNRT president, Xanana Gusmão. Thus plans were put in place for training the East Timorese people in the political process. During 2000-2001 a large number of refugees from Indonesian (West) Timor have been repatriated by the UNHCR (United Nations High Commission for Refugees) and IOM (International Organization for Migration). It was estimated that 190,000 of the 250,000 forcefully evacuated ‘refugees’ returned (ibid). The repatriation of former militia members was part of this overall reintegration of refugees. This period also was plagued with a number of militia incursions from West Timor, however, the UN Peace Keeping Forces kept things under control. Furthermore, there were reported cases of mistreatment of returning former militia members in East Timor. Such situations arose sometimes, since local UNTAET officials permitted the CNRT security groups to screen returnees with regards to former association with militia. In 2000 UNTAET also set up a Serious Crimes Investigation Unit (SCIU) to address the human rights abuses during 1999. During 2001 leading up to the 30 August elections of a Constituent Assembly, the Transitional Administration undertook extensive voter education activities along with the help of several local NGOs. Therefore, whether illiterate or educated, all people had access to information. Even the most remote villages received training on different forms of government and the choices of government for the constituent assembly elections. Aside from UN and NGO voter educators, there were several civic education pamphlets given out and posters displayed, as well as civic education being broadcast on radio and television. Albeit radio reception was very poor in high mountainous regions and ownership of television, let alone access to electricity outside of Dili, the capital, was problematic. The population was also consulted on what they want to see in the constitution that the 88 member Constituent Assembly will have to draft in just a few months. Civic education was provided in the lingua franca of Tetum. 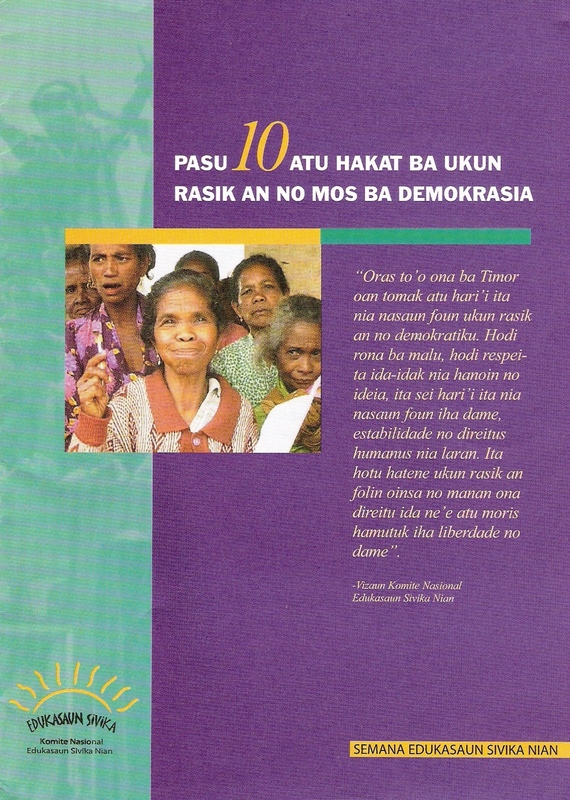 However, a survey done by The Asia Foundation (May 2001) in 392 hamlets of 196 villages in 13 districts of East Timor, suggested a lack of understanding of not just the political process but of basic concepts such as ‘democracy’. For example, 36% defined democracy as freedom of speech (2001:11). Also the majority of the population from four districts I observed as an election observer during the summer of 2001 was fearful of many political parties as they were concerned with possible violence and civil war as they experienced in 1975. A large portion of the population also lacked understanding of the purpose of the elections, that is, an election for a Constituent Assembly. Many thought of it as an election for president (ibid). In Letefoho, Ermera district at the cross roads I saw a locally made sign displayed that gave the date of the election, 30 August, and had the inscription Xanana for president. By April 2001 various political groups and political parties emerged. Some of these political parties will be quite familiar to the reader from the earlier history section that describes events in 1975. Table 1. lists the political groups and parties and their leadership as well as which of these groups registered as a political party with candidates running for the elections on 30 August 2001. Therefore, there were candidates from 16 parties running for the 88 parliamentary seats with national and regional representatives. During the campaign period there were certain regions where tensions rose and accusation were flying against the CPD-RDTL political group. These accusations that could not be proved one way or another included wide spread intimidation and threat of violence as well as in one place in Ainaro, claims of registration documents being confiscated by the village head so people cannot go and vote. The stance of this political group, and please note this was not a political party, was that East Timor already declared its independence in 1975 and the country should return to that structure established a few days prior to the Indonesian invasion. They refused to acknowledge both the validity of the August elections and the authority of the United Nations Transitional Administration. PST also steered things up with their not so clandestine association with Indonesian an Indonesian group called, Action in Solidarity Indonesian and East Timor, in the districts of Ermera—with their headquarters in Atsabe. The general population was also afraid of a civil war given that there were no less than 16 competing registered parties. In order to ensure that the population would participate in the elections, and thus to assuage fears, as well as to ensure a fair election, all 16 parties signed a National Pact of Unity on 8 July 2001. 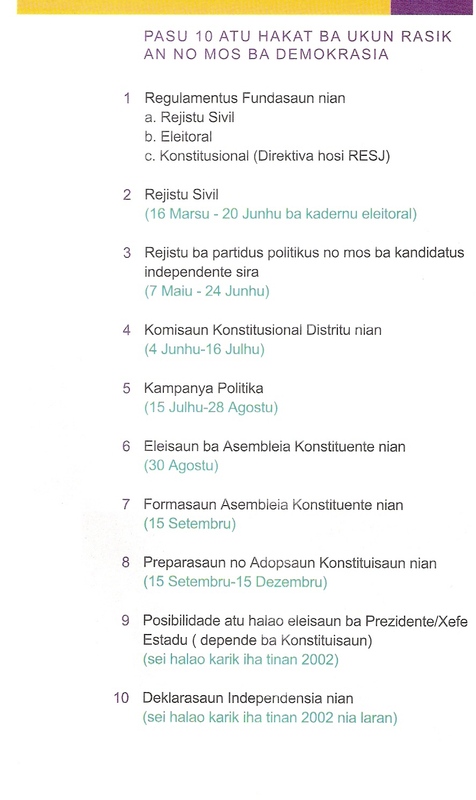 Aside from the 16 parties there were also five independent candidates. The majority seats were won by the FRETILIN party. It secured 55 of the 88 seats; 43 national and 12 district seats (Fox 2003:15). The other parties that won national seats include: PDC (2 seats), UDT (2), PD (7), KOTA (2), PNT (2), PSD (6), UDC/PDC (1), PPT (2), PST (1), ASDT (6), PL (1) (ibid:16). At the district level FRETILIN, ASDT, PSD and PD were the main contestants. From all the parties, FRETILIN was the best organized as a party and also in terms of its platform and financial support. By February 9, 2002 the new parliament wrote and approved the Constitution of the new nation of the Democratic Republic of East Timor. Next the presidential elections ensued with two candidates: Francisco Xavier do Amaral and Xanana Gusmão. While the former’s campaign was supported by the ASDT party, Xanana refused any party endorsement and campaigned on his own. He received 82.7% of the votes. On April 14, 2002 Xanana Gusmão became the first president elected, while Mari Alkatiri, the leader of the majority party FRETILIN became the prime minister. On May 20, 2002 East Timor became officially independent. The same year it also became a 191st member in the United Nations. UNMISET-- United Nations Mission of Support in East Timor-- was established by the Security Council to provide assistance to East Timor over a period of two years until all operational responsibilities are fully devolved to the East Timor authorities (http://www.un.org/Depts/dpko/missions/unmiset/). UN personnel remained to advise, their presence is in a much reduced capacity. In May 2005 the UN Security Council extended UN presence in East Timor through mandating the UNOTIL, the United Nations Office in Timor Leste which is anticipated in operating until May 2006. The goal of UNITOL is to continue to provide assistance to East Timor, as the country progresses towards self-reliance. On 20 May, 2005 the United Nations ended its peace keeping activities in East Timor. Nation building faces a number of challenges, however. Just to mention a couple of these difficult tasks ahead: to build a legal system that would address a range of national and international legal issues; the economic challenges faced by the new nation are also daunting. For over a decade the country will have to relay mainly on the contributions of donor nations, as oil explorations will not generate enough revenue in the near future. The country does not have an economic and manufacturing infrastructure, so even something as basic as a box of matches or a package of crackers will have to be imported from Indonesia. For the country’s survival and maintenance until it can reach a state that resembles a form of self-sufficiency, East Timor will be dependant on the international community, particularly its neighbors—Indonesia and Australia. During the summer of 2001 I served as an election observer again for the Carter Center. As a long term observer I spent two months monitoring the situation in four different districts, Manufahi, Ainaro, Aileu, and Ermera. In Ermera district, at least, even after the dissolution of the CNRT, its security groups were still active, particularly in such screening process of returnees, right down to the hamlet level. In 2002 while I was conducting my anthropological research in the Atsabe subdistrict of Ermera district, I was often told that these security groups are extremely careful in their screening process. Officially, those with former militia ties were said to have been reintegrated peacefully and without much incidents. Unofficially, in the various villages of the subdistrict, people freely discussed how former militia were first beaten, or had to live under house arrest for the rest of their lives in the homes of former CNRT security people as virtual slaves, or entire villages took on a dual organization where the reintegrated former militia were sequestered to one half of the village while regular citizens occupied the other half. Severity of beatings depended on the severity of their crimes. Those living under ‘house arrest’ were constantly threatened if they did not perform their ‘slave duties’ as a repayment for the harm they had caused during 1999. For details about the platforms and programs of these political groups see Pat Walsh, Australian Council for Overseas Aid, April 2001 report entitled East Timor’s political parties and groupings: briefing notes. Table One is based on the information provided in this report and also on Fox 2003:15-23. During election observation duties, people tended to talk about this union as if a merger has taken place between an official party and a political group (ASDT and RDTL). However, overlap in personnel and similarity of agenda and platform, and information from local level CNRT security groups suggests the former interpretation, that is, ASDT was the public party face of RDTL. Some party representatives of ASDT tried to distance themselves, at least in rhetoric, from RDTL that engaged in some questionable behaviour of reported intimidation during the 2001 campaign. http://www.electionworld.org/easttimor.htm not only provides election results from East Timor’s last elections but also links to political party site.